A propòsit de l'obra teatral La Marquesa de Sade, en cartell al Teatre Akadèmia, tindrà lloc aquesta xerrada entorn a aquesta obra de Mishima, escriptor i dramaturg japonès, considerat un dels autors més importants del seu país. Oakland - The Seated Diesels discuss "The Sound of Waves"
Diesel, A Bookstore in Oakland welcomes The Seated Diesels back to the store to discuss The sound of waves by Yukio Mishima on Wednesday, October 9th at 7 pm. Description: Join us and improve and expand your English speaking and reading skills as well as learn about American and other cultures. "The Sound of Waves" by Yukio Mishima will be discussed and copies will be available at the Information Desk. Call 240-777-0200 for more information. Yukio Mishima , Forbidden Colors. Yukio Mishima is currently considered a "single author." If one or more works are by a distinct, homonymous authors, go ahead and split the author. 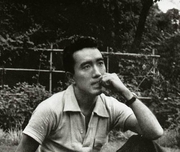 Yukio Mishima is composed of 35 names. You can examine and separate out names.